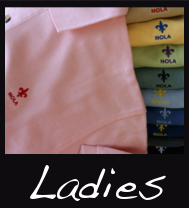 NOLA Shirts -New Orleans Shirts, Mardi Gras Shirts, Fleur de Lis Shirts, Hats and so much more - Embracing New Orleans Soul with Style. our Fleur De Lis Shirts! Nola Shirts has now launched Nola Belts! 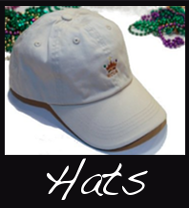 Available in several colors - Hunter Green with Pelican, Tiger Yellow, Saints Black, Royalty Beige. New - Navy Men's Pelican Pique Knit Sport Shirt. Fleur de Lis Pique Knit Sport Shirt with Dem Saints on Collar. Red NOLA Jazz Hats are IN! Looking to pickup NOLA Shirts Locally? 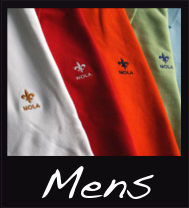 Click here to find your local New Orleans merchants carrying NOLA Shirts Apparel. Sign Up Below for our new promotions, product announcements, and added locations with our new newsletter! Get your Lookup T- Shirts! Tired of people staring at their cell phone? Send them a message they can understand! Available in in two colors, Athletic Blue, and K&B Purple. Sizes - Small, Medium, Large, Extra Large.